Look out! Here he comes. 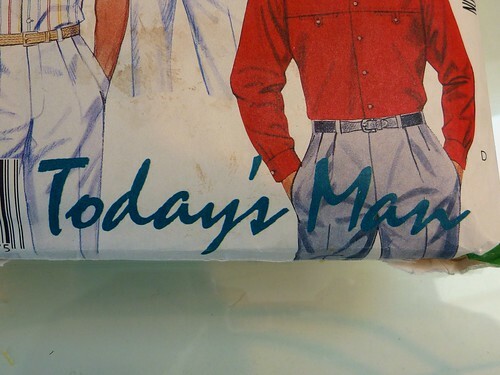 It's today's man. 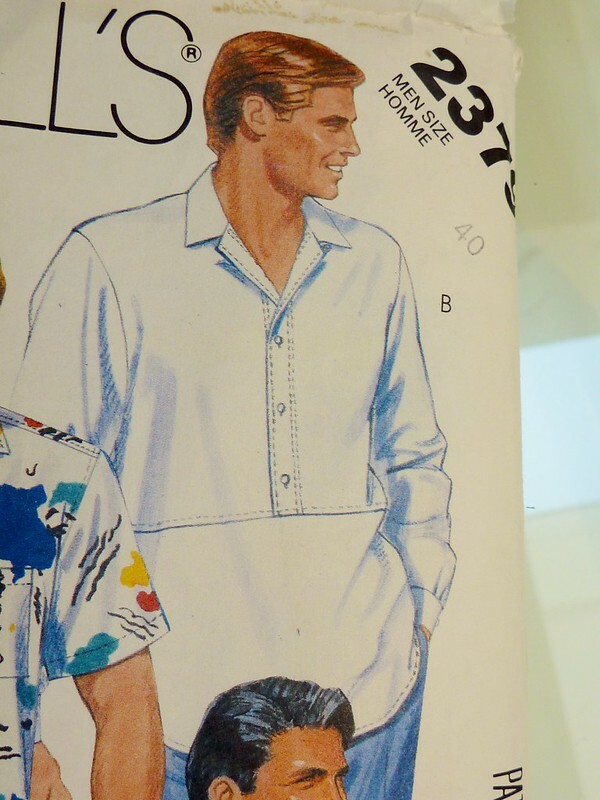 I've bought a few new (actually old) patterns lately, and this McCall's pattern from 1986 is one of them. I picked this up for a couple of reasons. First of all, it's a little different; which is something we guys struggle to find. There's just not much variety out there for us. I've decided to make this version, View E. Some of you will no doubt see that this pattern is very similar to the Willi Wear shirt that Peter over at MPB just made (and didn't totally love). This version has a camp collar and button tabs at the chest pockets. Little details like that make it much more interesting and wearable IMO. Stripes tend to feature heavily in a guy's wardrobe, usually vertical stripes on a shirt or suit. Honestly, it gets a little tiring after awhile. So this combination of both vertical and horizontal stripes seems refreshing. The second reason I picked this pattern was for View B, but I will have to devote an entire post to it. It involves an incredible surprise that came in the mail. So stay tuned. 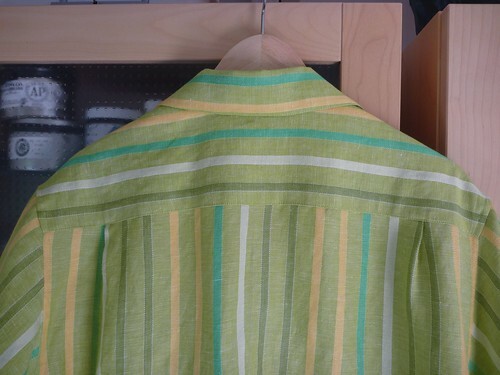 I'm going to be making my shirt from a striped linen that I picked up during last year's MPB day. Unfortunately, I wasn't able to attend this year, but it looked like a blast as always. This fabric is from Gray Lines Linen on W 39th St. 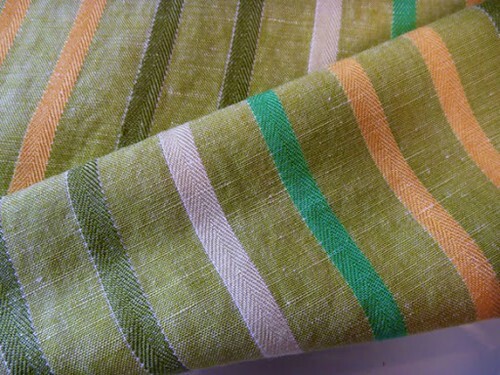 They have every kind of linen imaginable, from metalic linens to linen velvet, even linens to make your own dish towels. I just love this store. Everything is neatly arranged and the prices are ridiculously reasonable. In fact, the last time I was there this fabric was on one of the sale shelves for $4 / yard. Incredible. 100% linen, 60" wide. 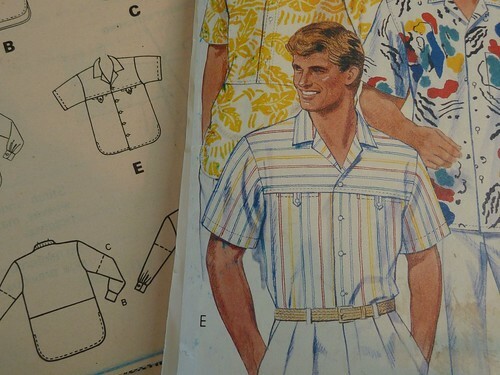 I'm learning that I need a sloped shoulder adjustment on just about everything, so I checked my TNT shirt pattern against this McCall's pattern. Yup. I need it here. 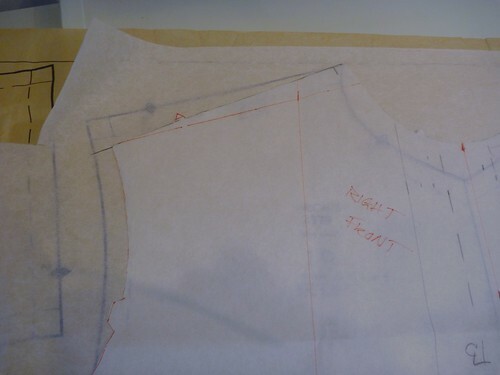 I traced off the pattern and made a quick and dirty muslin. In typical 80's style it's oversized, but I'm OK with that. I like Hawaiian shirts, and this shirt has a similar fit. What I didn't like was the shirt tail hem (way too long), and the lack of a back yoke (flimsy and cheap looking). So I set out to improve on Today's Man. 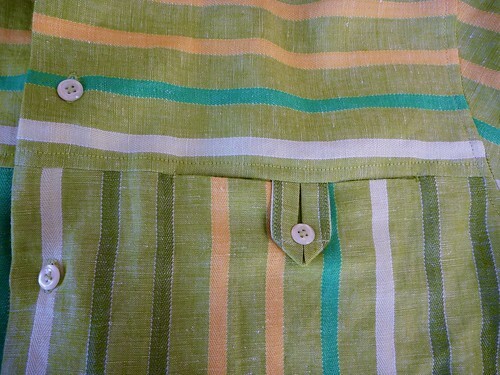 I squared off the hem, shortened it considerably and added little extensions that will become side vents. The back will be an inch longer than the fronts in my version. 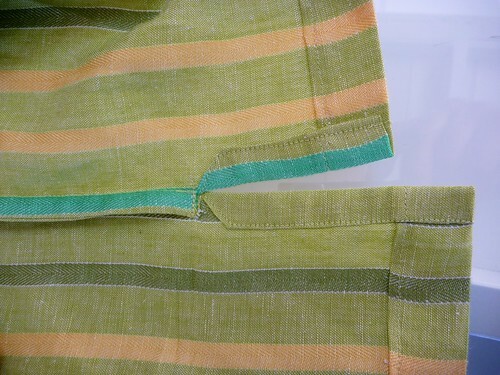 I learned from making my last pair of pants that making a French seamed pocket is really very simple to do. Here it is in progress on the chest pocket. Why the pattern directions don't include such a simple step is really vexing. I swear they just want us to be dissatisfied with the end results. No wonder so many people give up on sewing! This shirt would be a frayed mess inside if made according to the instructions. I can just picture a guy (most likely having this shirt made for him) saying, "um, yah, thanks for the shirt", and then trying to lose it in the back of the closet. This was another easy improvement. Understitching the pocket bag, which gives the pocket opening a crisp finish and prevents the pocket from poking out. It takes all of 30 seconds. Of course the instructions don't include it. 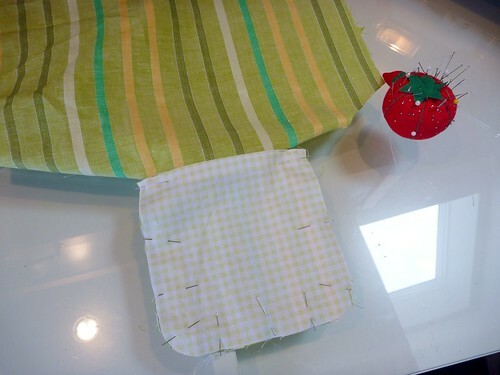 The facing is interfaced with Fashion Sewing Supply's Pro-woven light crisp fusible interfacing. I can't rave about this product enough. Because it's woven, it can be stitched to the facing,turned and then fused. 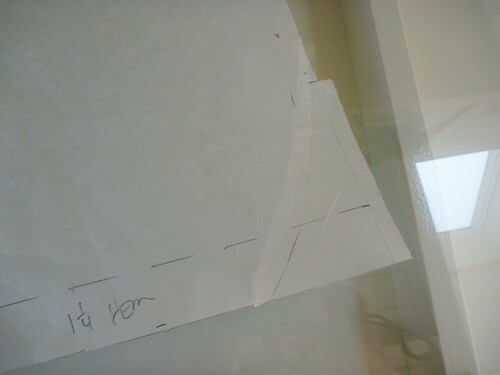 It makes a beautiful clean finish, and you can skip all that trimming of the interfacing, folding over 1/4" and then topstitching. It's a big time saver and the results are so much nicer. 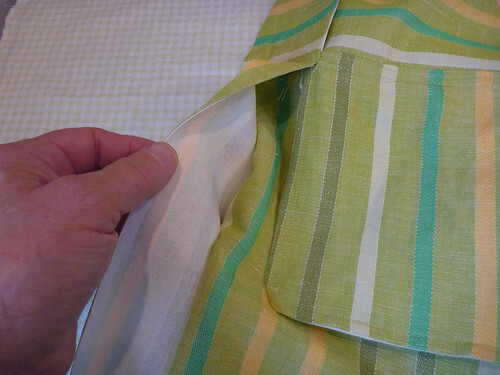 Here you see it tacked into the horizontal pocket seam. It overlaps the pocket bag slightly and helps keep it in place. I added a back yoke and small pleats. Simple. Now it seems like a real shirt. Here is one of the little button tabs. Surprisingly, they actually work and keep the pocket closed. I was worried that the button would just pop through the loop. I'm pleased with how they turned out, and they give this shirt some much needed pizazz. I made a French seam down the sides, ending at the vent. A little clipping here and there... Fold the extensions in and then stitch them down. I then bar tacked along the bottom of the French seam. So here is the new and improved Today's Man. I know I'll truly enjoy wearing this shirt. Now to make a pair of linen shorts to go with it. Great fabric and construction techniques. Lovely shirt. Don't tell my husband, ok? Oh, this is so much better than my Williwear pattern! Must track this one down. Peter, it's #2379. I should have included that. I hope you can find it. Nice! 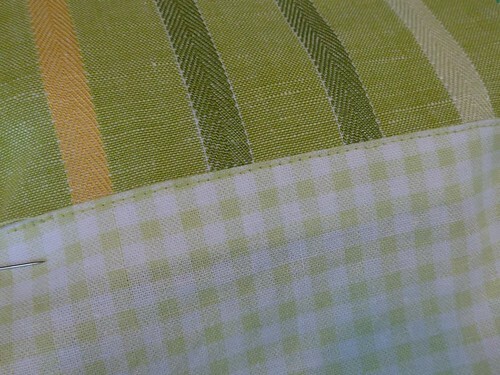 I remember seeing that fabric at last year's MPB Day - looks great made up. Wow! Such impeccable and detailed stitching. Beautiful shirt. All the extra details you added make this much better than the original pattern. Beautiful shirt. You have totally ramped up the quality and styling with your changes. Beautiful stitching. Gorgeous shirt. Your workmanship is spot on. Enjoy wearing this one. I totally love that shirt. The choice of fabric is gorgeous! 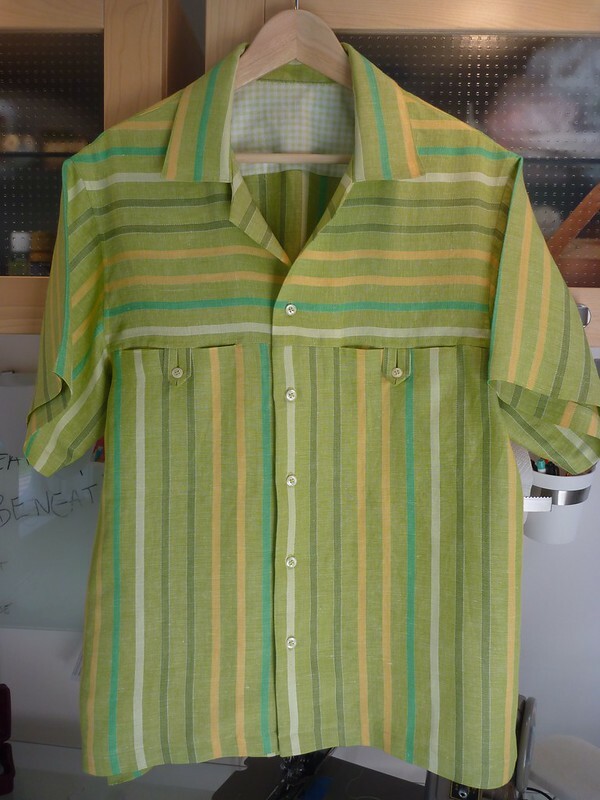 Wonderful shirt from great fabric! The little tabs on the pockets...perfection and just wait for the compliments to flow...wow...gorgeous and the vent and French seaming...divine!